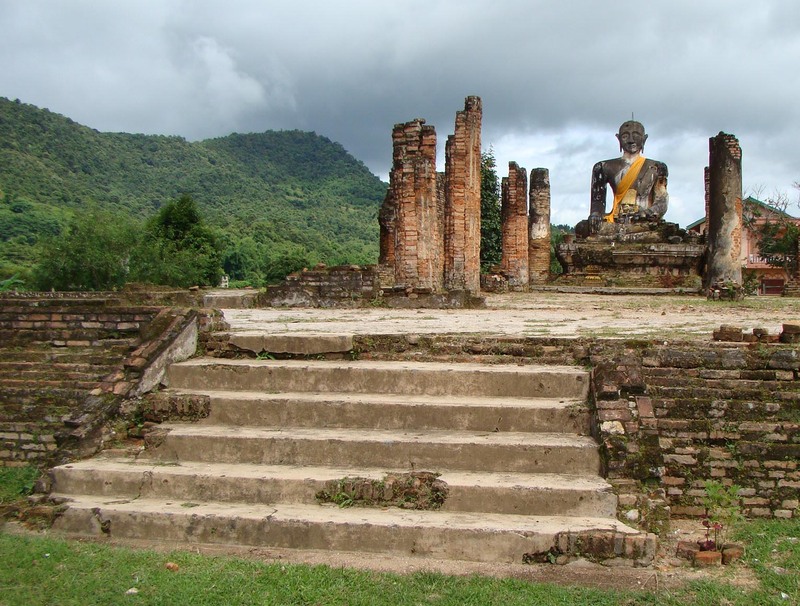 Lingering Effects of the War in Laos – Patrick F. Clarkin, Ph.D. The Lao National Regulatory Authority (LNRA) recently released an impressive, 106-page report on the victims of unexploded ordnance (UXO) over the last few decades. The authors, Mike Boddington and Bountao Chanthavongsa, and all of the associated researchers should be commended for this invaluable contribution, which documents in a systematic fashion the damage done by the war. Researchers covered more than 9,000 villages in Laos (95%), collecting retrospective data from interviews with residents about injuries or deaths caused by mines, large bombs, mortars, bombies, etc. from 1964 to 2008. In all, the report found that more than 50,000 people were injured or killed by UXO in Laos, though the authors acknowledge that this is likely an underestimate, perhaps by as much as 20%. Results revealed that Savannakhet and Xieng Khouang provinces were the two most affected in terms of the number of casualties, which makes sense, given their strategic and geographic importance in the southern and northern parts of the country, respectively. For some historical background, the wars in Laos were on-again/off-again and small in scale since the end of World War II, but the conflict escalated considerably with the commencement of American bombing in 1964, which continued until 1973. The numbers concerning the amount of ordnance dropped are staggering. More than 580,000 documented bombing sorties were flown over Laos, constituting more than 2 million tons of ordnance dropped over an estimated population of 2.4 million people (or 0.87 tons per person, the highest amount per capita in history). Figure 1 of the report (below) illustrates the temporal trends of the number of casualties. 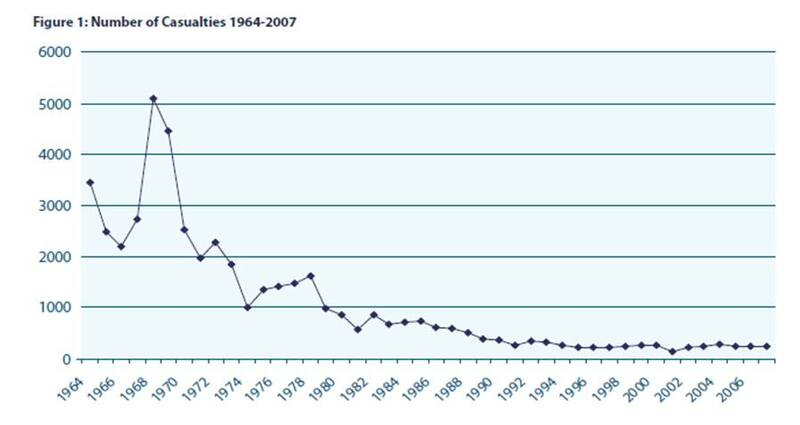 The graph shows that the number of casualties peaked in 1968. This coincides with the diversion of air power from Vietnam to Laos after President Lyndon Johnson’s order of the cessation of bombing parts of North Vietnam that year (Conboy, 1995: 196-201). Incidentally, 1968 also saw a corresponding increase in the numbers of internally displaced persons in Laos fleeing to safer parts of the country (U.S. Congress, 1970: 17). The number of refugees receiving assistance from USAID remained between 100,000 and 130,000 from 1963 to 1968, jumped to over 200,000 by mid-1969, and peaked at 353,297 in late June 1973 (USAID, 1973: 22-4). What is particularly significant from the LNRA report is that 40% of recorded casualties actually occurred after 1973, the year that bombing ceased. The nature of the bombing campaign, in particular the widespread use of cluster bombs, meant that it was inevitable that massive amounts of ordnance would remain in Laos for decades. Khamvongsa and Russell (2009) note that between 1996- 2006, removal teams had cleared approximately 144 km2 of land, or just 1% of high-risk areas and only .04% of total contaminated land. In a 2009 AlertNet article by Thin Lei Win, Boddington stated that “after 15 years of official clearance operations, we have managed to clear about 400,000 (of an estimated 80 million cluster bombs still in Laos). If you do the sums, you’ll find that in order to clear all of the bombs in this country, it will take 3,000 years.” Think about that. Meanwhile, the number of UXO casualties remains around 250 people per year into the present, 37 years after the bombing campaign officially ended. Figure 27 of the report is also telling. Even during the war years, only slightly more than half of UXO victims were actually soldiers, and this percentage dropped precipitously over the years. Data from other wars reveal a similar pattern, which is that civilians rather than combatants are more and more likely to bear the brunt of war. In fact, the percentage of war deaths occurring in non-combatants has risen from 14% in the First World War, to 67% in the Second World War, to 90% in wars of the 1980s and 1990s (Ahlström and Nordquist, 1991; Holdstock, 2002). Gino Strada reported similar statistics among victims of war-related trauma from various countries in the 1980s and 1990s: approximately 90% of those injured were non-combatants, and 34% were children under the age of fourteen (Strada, 2004: 131). Given such statistics, it is clear that war is not merely a political or military matter, but instead is an enormous threat to public health. It is a human tragedy that we keep doing this to ourselves. Ahlström C, Nordquist K-A. 1991. Casualties of Conflict: Report for the Protection of Victims of War. Uppsala, Sweden: Department of Peace and Conflict Research. Conboy K. 1995. Shadow War: the CIA’s Secret War in Laos. Boulder, Co: Paladin Press. Holdstock D. 2002. Morbidity and mortality among soldiers and civilians. In War or Health?, I Taipale, ed. Pp. 183-197. London: Zed Books. Khamvongsa C, Russell E. 2009. Legacies of war: cluster bombs in Laos. Critical Asian Studies 41: 281–306. Strada G. 2005. Green Parrots: A War Surgeon’s Diary. Milan: Charta Books. United States Agency for International Development (USAID). 1973. Facts on Foreign Aid to Laos, July, Internal ref. #: PN-ABI-555. U.S. Congress. Senate. Committee on the Judiciary. Subcommittee to Investigate Problems Connected with Refugees and Escapees. 1970. Refugee and civilian war casualty problems in Laos and Cambodia. Hearings, Ninety-first Congress, Second Session. Washington, D.C.: U.S. Government Printing Office. Win TL. 2009. Allure of scrap metal hard to resist in Laos. http://www.alertnet.org/db/an_art/52132/2009/10/30-111653-1.htm Accessed February 24, 2010. This entry was posted in Global Health, Laos, UXO, War and health and tagged Epidemiology, Laos, UXO, War. Bookmark the permalink. Pingback: Laos: The Not So Secret War « Patrick F. Clarkin, Ph.D.
Pingback: Meeting to Ban Cluster Munitions, Vientiane Laos « Patrick F. Clarkin, Ph.D.
To this factors, U.S government should respond and offer more funding to all the victims in LAO PDR. Its not fair that some children in the unexploded autobom areas. My name is Bill Chapman. I am writing book about historic sites in Southeast Asia and wonder if I could use your image of the ruins temple in Xiang Khouang. this is an academic publication with little hope for royalties; so I am asking if I could have permission for a single use of your photograph. It would add greatly to my work and I would certainly credit you. Sure, that’s fine. You have my permission. Hi William. No worries. Best of luck with the book.